Starting April 4, Washington, DC restaurateur and real estate leasing agent Andy Seligman will launch Royal Sprinter, a luxury van service that will travel between DC and New York. Joining Vamoose, Amtrak and the Bolt Bus, this is just the latest in a fleet of options for frequent travelers up and down the I-95 Corridor. 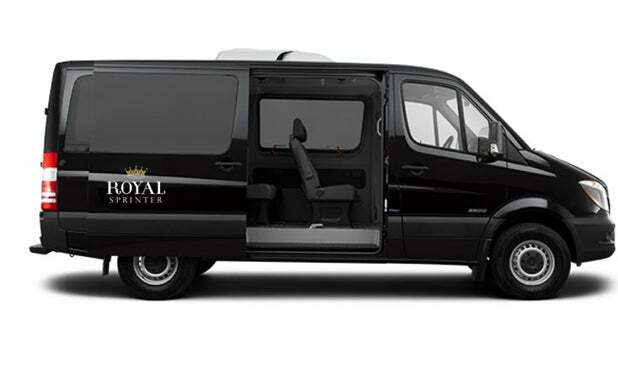 Royal Sprinter will initially roll out in two customized 14-foot Mercedes vans, each with eight diamond-quilted leather seats in a staggered layout designed to keep passengers from rubbing elbows. Two onboard routers enable the complimentary WiFi, and each reclining seat has its own seven-inch flatscreen monitor with 150 channels of DirectTV (including HBO and Showtime), as well as its own extending leg rest, tray table, cup holder and overhead cabinet space. Stocked fridges can be found onboard, and passengers can help themselves to snacks and bottled water, but there are no bathrooms onboard. Priced at $90 each way, the approximately four-hour journey will travel between the Park Hyatt at 24th & M Streets in DC or the Embassy Suites in Chevy Chase, Maryland, and the Loews Regency New York Hotel at Park Avenue & 61st Street. 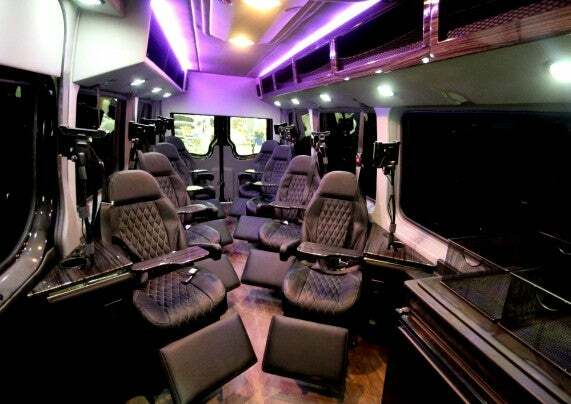 The Sprinter’s daily roundtrip service will travel DC-New York from 7-11:30am and New York-DC from 3pm- 7:30pm. Among the competition the Royal Sprinter is joining is the business-class Vamoose Gold Bus, which 36 reclining leather seats in a 1 x 2 configuration (as opposed to the cloth-covered 56 seats in a 2 x 2 found on the regular Vamoose bus). For $60 each way in a range of 4- to 5 1/2-hour journeys, Vamoose Gold offers one to two daily roundtrips between New York’s Penn Station from the Virginia Railway Station in Lorton, Virginia, with stops near the Metro stations in Rosslyn, Virginia and Bethesda, Maryland. WiFi is complimentary as well, and seats come with 110V AC power outlets as well as tray tables, cup holders and overhead bin space. 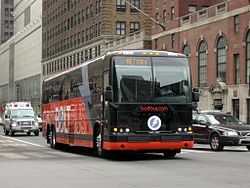 Though it’s the least glamorous option, the Bolt Bus offers nine daily trips (between 7:30 am-11pm) from DC’s Union Station to a choice of two New York stops: near the Javits Convention Center or down on 6th Street between Grand and Watts. One-way, non-stop service to either stop ranges from $20-28. 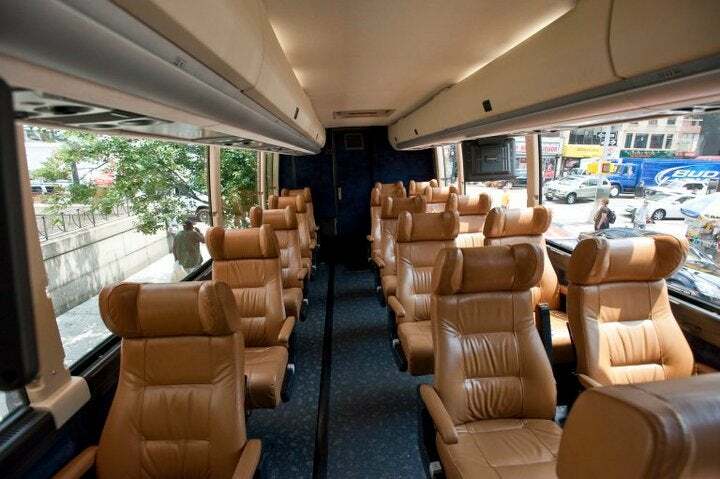 Each air-conditioned bus has 50 wide, leather-upholstered seats in a 2 x 2, configuration, WiFi is again complimentary (and provided via hotspots at a speed that are less than ideal for large downloads), and there are 110V AC power outlets at every seat. Venerable standby Amtrak continues to be the most expensive option overall, but also the quickest; travel time between D.C.’s Union Station and New York’s Penn Station averages 3 hours or less. Two trains take this daily route almost every hour, the Northeast Regional (21 daily roundtrips, 3:15am- 10:10 pm) and the high-speed Acela Express (16 daily roundtrips, 5am-8pm); low-bandwidth WiFi service is available to all passengers on either of these trains. 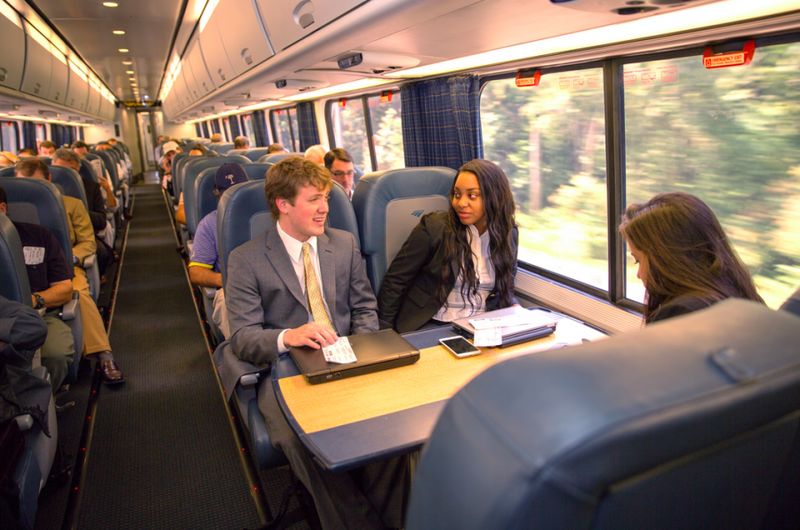 On the Northeast Regional, one-way prices for coach seats vary between $49 (unreserved and non-refundable), $84 (reserved and refundable with restrictions) or $164 (reserved and fully refundable) and $125 for unreserved business class seats. Acela Express has no coach seats; one-way business class starts at $259 and first class at $347. Both the Northeast Regional and Acela Express offer complimentary, low-bandwidth WiFi and have club cars offering snacks and coffee. Northeast Regional business class seats and both business and first class seats on the Acela Express come with 120V AC power outlets, extra legroom, fold-down trays, and overhead storage; only Acela’s first class, though, comes with at-seat attendant and meal service, as well as access to Club Acela lounges at both train stations. With prices relatively comparable to Amtrak coach seats, travel times that line up with Vamoose and Bolt, and more amenities than just about any other option (aside from Acela’s lounge and attendant perks for about three times the price), it’ll be interesting to see if Royal Sprinter will win the high-end commuter race from DC to New York. The seats certainly look nice, and the amenities sound good, but I personally wouldn’t be thrilled to be in a van for 4 hours without the chance to get up and walk around. However, I might just try it out myself next time I’m traveling between the two cities, but if you get the chance to before me, be sure to share your thoughts in the comments!